as you can see, I have a button that allows to create a new project, clicking this button will open a pop up (where you can create project). as soon as you are done, the list will have one more item (project). The question: what happens at the first time that the user opens the app and there are no projects? or, any other suggestions that you might have? Select menus don't typically contain buttons, or trigger actions just by making a selection, therefore a user isn't immediately going to think to search for this feature in there. Select menus require the user to explicitly expand them before all of the options are revealed. This reduces the visibility of this critical feature. It doesn't seem intuitive to group the "Create new project" functionality inside a list of existing projects. It seems analogous to selecting File > Open > New Document in Microsoft Word. Instead, I'd suggest placing a small + Create New Project button near the select menu. You mention that this triggers a modal, so any errors or misclicks can be easily fixed by just closing the modal. I think that "New Project" (as opposed to Select) is clearer. The word "Select" implies existing projects and the user may wonder "where do I create a new project." The user would have to think "Oh, let me look here." To further reduce ambiguity I would change the label from "New Project" to "Create New Project". You can either have a button that reads "Add First Project" without a dropdown. Then you can show the dropdown after the first project has been added. 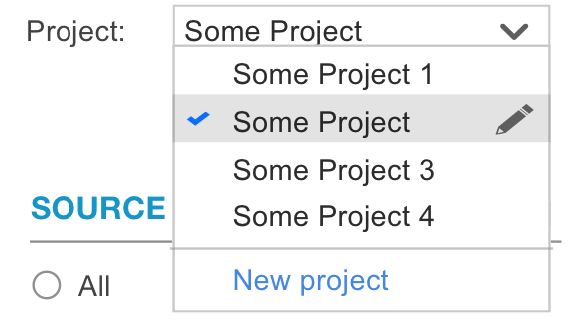 If you absolutely need to show the dropdown, you can also have the dropdown, with a text that reads "No Projects" then follow that with button to create the first project. How to elegantly create new parent when midway creating new child and realize you need a new parent?